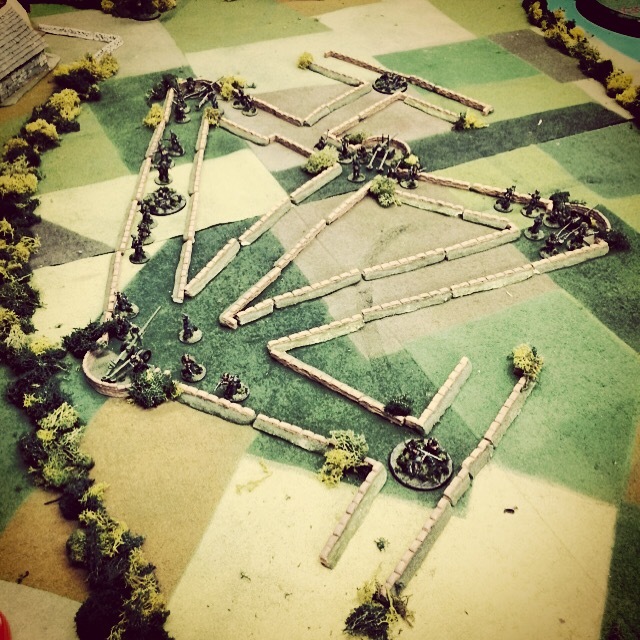 This year’s 71st anniversary of the Allied invasion of Normandy on June 6, 1944 didn’t get the same attention as last year’s full weekend of D-Day gaming at Metropolitan Wargamers in Brooklyn, NY. 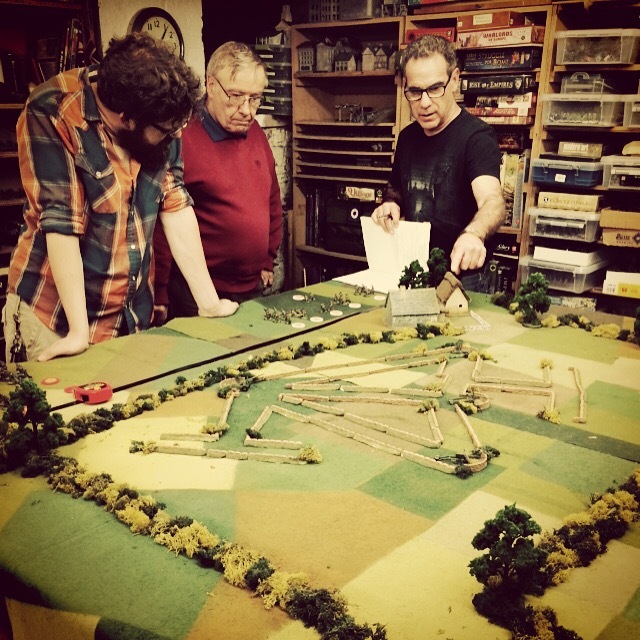 Even so, a few of us did come together for a quick run through a gamer favorite small-scale battle at Brecourt Manor. Made famous in more recent years in the hit HBO series Band Of Brothers, the action at Brecourt Manor by a couple dozen men from the US 101st Airborne has long been a favorite for military historians and a textbook example of a small-scale assault on a heavily defended position. 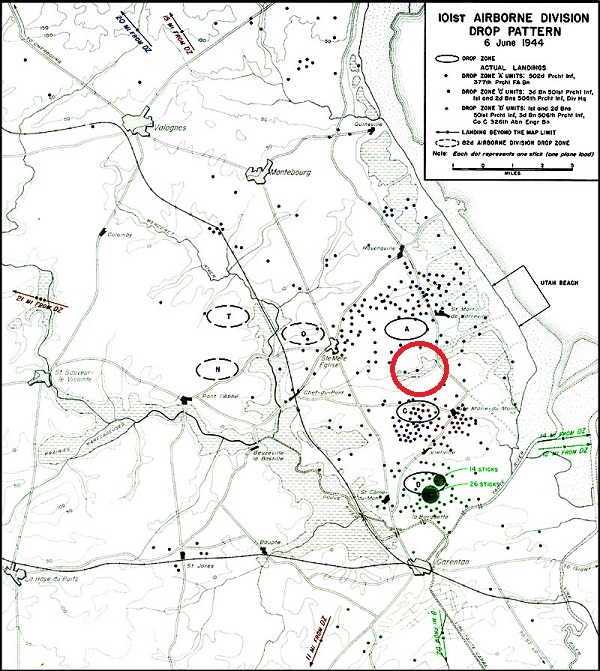 With four 105mm howitzers firing on Utah Beach, the German gunners were defended in a series of shallow trenches by several MG42 heavy machine guns and a number of infantry. Through surprise and quick movement through the trenches, the US Airborne quickly took the position and disabled the German guns. 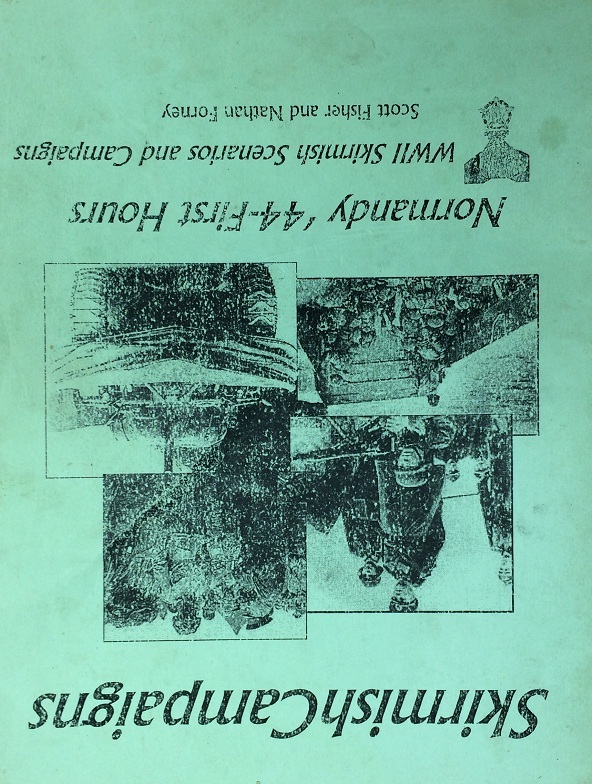 For our replay of Brecourt Manor, we turned to the classic Normandy ’44 – First Hours scenario book from Skirmish Campaigns. The Skirmish Campaigns series of books offers well-researched and detailed campaign scenarios filled with orders of battle, terrain layout maps and deeply descriptive narrative of how actual engagements unfolded during World War II. Adaptable to a number of rules systems, the scenario as outlined in the book scaled nicely to our game. Using most of my recently painted 28mm German and US troops and classic Battleground WWII skirmish rules, we were set to replay Brecourt Manor. 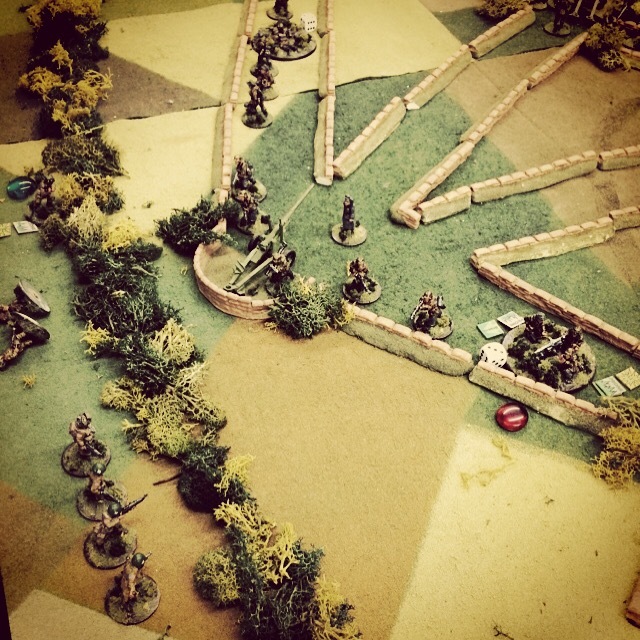 Two players split their command as the US Airborne and set their battle plans before my Germans deployed in the trench system. Beginning German positions were defined by four gun emplacements each crewed by a team of five rifle-armed gunners and an officer. I also placed three MG42s at different points in the trench lines and one patrolling battery command squad of four riflemen and two officers deployed at the western end of the position. The Americans moved first, slowly deploying a .30 cal machine gun crew from behind the farmhouse at the northwest corner of the table. Directly to the north, a bazooka team crept into position behind a copse of trees with two fire teams behind the nearby hedgerows in support. To the west and toward the south, the other two US fire teams set up and moved toward the German lines, also under cover of the thick bocage. Spotting the American bazooka team to the north, I quickly redeployed one of my machine guns to hold back the advance on that side of my position. Not waiting to get their machine gun in place, the Americans advanced on two sides and took heavy fire to their fire teams leaving them pinned in place. Hoping to pin down the Germans at the strongly defended north and western edges of the position, the US machine gun attempted to lay down a stream of fire but jammed is the trigger was pulled on its first shot of the day. Even under fire, the US bazooka team managed to get into place and a shot destroyed the northernmost howitzer, killing one German gunner and suppressing most of the rest of the gun team. On the western side, another of my redeployed machine guns was instantly spotted and raked with American gunfire and all but knocked out of the rest of the game. With only one MG42 left in the western trench line, a US Airborne team moved with over confidence toward making their first assault. 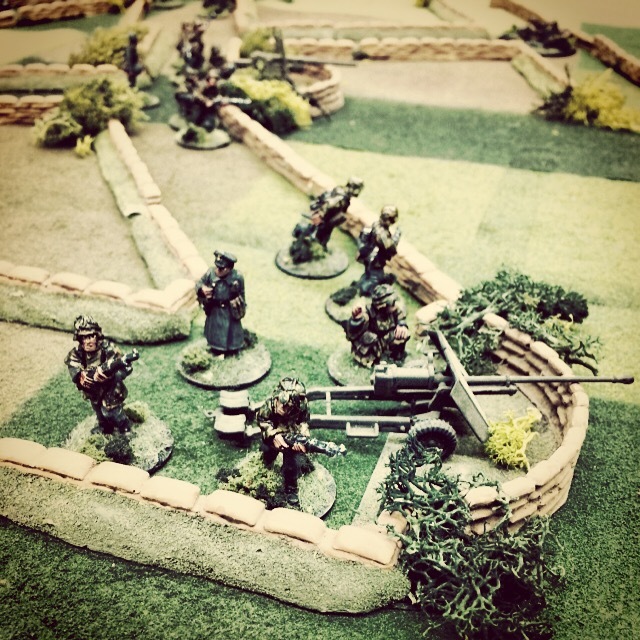 The foolhardy bravery of the Americans was met with combined arms fire from my remaining MG42, rifles at the gun position and shots from the command squad. When the smoke cleared, one American fire team was left with just one man standing and the other had been briefly pinned. By turn three, the American machine gunners cleared their jam and were finally able to lay down strafing fire along the entire western edge of the German trenches. With bullets whizzing overhead, the Germans were forced to the ground and the remaining Airborne came over the hedge and made way for the German howitzer. The Airborne soldiers poured into the German gun position and hand-to-hand combat ensued leaving two Germans and two Americans dead in the melee. With no clear victory in the first close combat of the day, the Americans bounced out of the German position, pulling back toward the hedges from where they had just come. 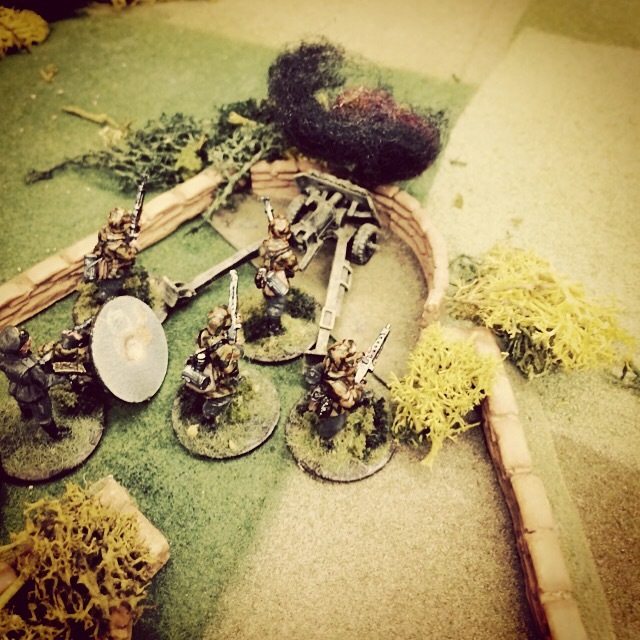 Back to the north, the American bazooka team had been cut to just one man who had retreated under heavy fire. One other US rifle team at the north had been eliminated, and the last had been whittled to just two injured men. With just a few rattled troops strung along two sides of the field, the US Airborne retreated and left three guns ready to continue raining shells on the beaches in the distance. What the scenario showed us, as it did on the actual day some 71 years ago, was the importance the US machine gunners in a tight assault like the one at Brecourt Manor. Met with a larger, more well-defended German force, the American machine guns were the equalizer in real life. Had the American soldiers on our tabletop focused their assault after pinning the German defenders, our game this month may very well have gone the way of history with another victory in the hedgerows of Normandy. Hi Guys, Huge fan of the Battleground rule set. I have all the suppliments but looking for more Vehicle stat sheets, especially a Marder. Can anyone help.